The United States Anti-Doping Agency (USADA) announced Tuesday the decision by a three-member panel of arbitrators from the American Arbitration Association (AAA)/North American Court of Arbitration for Sport (CAS) finding that Justin Gatlin of Pensacola, Fla., an athlete in the sport of track and field, inadvertently committed a doping violation involving the prohibited substance amphetamine, which was in his prescription medicine. Gatlin, 20, tested positive at the 2001 USA Track & Field Junior National Championships in Richmond, Va., on June 16 and 17, 2001 for amphetamine, a stimulant, which is prohibited for use during competition under the rules of the International Association of Athletics Federations (IAAF). Amphetamine is not prohibited by the IAAF for use outside of competition. Gatlin’s prescription medicine, which he has been taking for approximately 10 years, contains amphetamine and was the cause of his positive test. Gatlin discontinued his medication several days before the competition but the medicine did not fully clear his system and trace amounts were detected in his urine. In accordance with the IAAF rules, Gatlin was suspended for two years from IAAF sanctioned competition, beginning on May 1, 2002, the day of the CAS Panel’s ruling but will receive credit for the period of time that he voluntarily did not participate in sanctioned competition, beginning on July 12, 2001. In addition, Gatlin will forfeit his first-place finishes in the 100 and 200 meters, as well as the 110-meter hurdles at the 2001 USA Track & Field Junior National Championships. 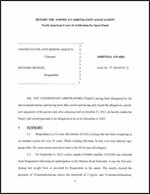 In issuing this sanction, the CAS Panel specifically stated that based upon Gatlin’s conduct and personal culpability, the CAS Panel would not apply the full two-year suspension and expressly retained jurisdiction of the case pending a satisfactory response by the IAAF Council to Gatlin’s request for early reinstatement based on the exceptional circumstances in his case, pursuant to the IAAF rules. This is the 13th sanction issued by USADA in 2002. USADA became the independent anti-doping agency for U.S. Olympic, Pan Am and Paralympic athletes on Oct. 2, 2000.